Is it really a price war? I, as many other developers, was shocked when I read that Reflexive dropped game prices below $10 (most for $9.99, but some for as low as $6.99). I was shocked not because of the price, but because you don’t need to join any discount program like you do have at BFG or PlayFirst. Price war… but is it really? I (re)started game development in 2004. Discount programs were already available. Big Fish Games had their Game Club at that time. So prices below $20 are available for at least 4 years. 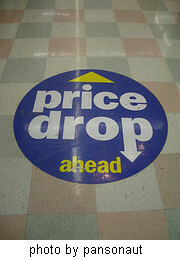 In my opinion price wars started in 2004. The only problem is that BFG wasn’t so huge until recently and competitors didn’t care. If you talk about portal sales then you talk about membership sales. No matter if it is BFG, iWin, Real Arcade. They catched customer with membership programs and full price sales are scarcity. We can cry that Reflexive dropped the price without bundling it with membership program, but lets think for a second. Did they have a choice? Do you think that BFG Game Club members will go to Reflexive to buy games for $6.99? No they won’t. The only hope for Reflexive is to catch all those people that don’t want to commit longterm at all or anymore. If Reflexive does not adjust their game prices to their competitors it will lose market share. Now, you may say that developers will not benefit from it, because it is just about the marketshare. Let’s do the math. 40% of $9.99 (less COGS) is still more than BFG royalty rate of $6.99 (or even $7.99) (still less COGS). So even if it is just about marketshare shift, if Reflexive steals BFG/PlayFirst/iWin/etc. customers then you actually earn more revenue. And we need strong competition between portals so one will not dominate and lower royalty rates. The only problem is that you still want to sell your game at $19.99. And I don’t know how to cope with that yet. Do you? This is why portals sell more than you do! Portals at War – should we start to worry? How to make $10.000 a month from selling games? I think the way you deal with it is: if you are making casual games, then you have to drop your price, if you are making borderline “casual” games and just trying to increase your dist. by taking advantage of portals, then you need to stop distributing on those sites. Reflexive doesn’t need to steal customers because Amazon will hopefully create MORE customers via their vast market coverage. I actually plan to price games minimum $19.99, and in some cases $24.95.